Slide shows for digital picture frames Slide shows only £2.99. Available world wide via download. Available Worldwide via Download. CD option available. Here you can buy slide shows for digital picture frames and modern TV's. Choose from a selection of Scenic, Specialised and Educational slide shows. Digital Picture Frames are a great way to show off your digital photos and memories or they can simply be used to add atmosphere and mood to your room. Maybe you are having guests and don't want your private photos on show but would love to show off your digital photo frame, well now you can with a Digi Slides Scenic Slide Show. Subjects available include Landscape, Snow Scapes, Flowers, Cute Animals and Military Aircraft in action. Got a Modern TV? you can display a photo slide show on that too. 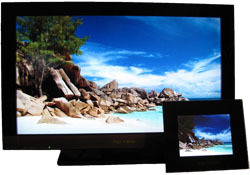 Modern flat panel TV's can be used to display photo's from a USB stick or SD memory card. These TV's are often called Multimedia TV's, Internet TV's or Smart Tv's. Such as the Sony Bravia, Samsung Smart Tv, LG, Philips, Toshiba Regza, Panasonic Viera, Sharp Aquos plus many more models and brands. Turn your TV into a large digital picture frame and show it off with a Digi Slides scenic slide show. Only for TV's that can display Jpg images. Educational slide show - an easy way to learn about the location of countries, their flag and capital city. This slide show is fun way for children to learn about the world and can also be used as a quiz game to complement their Geography lessons at school. Adults can also improve their knowledge of the world by displaying the Countries of the world slide show. Choose from 6 slide show collections. More details can be found in the slide show section including a free sample pack here. Find out about what the features of Digital Picture Frames mean with our Buyers Guide here.